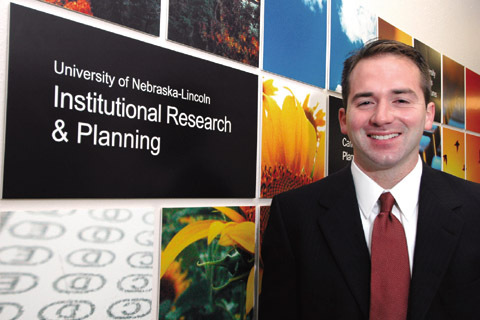 Bill Nunez is director of Institutional Research and Planning at UNL. His office provides data on all sorts of university statistics to a variety of sources and assists with larger campus planning issues. Photo by Brett Hampton. One of Bill Nunez's favorite sayings is, "Never change anything until you understand how it works." As director of the Office of Institutional Research and Planning, he helps units within and outside of UNL gain that understanding. A $2.5 million, five-year grant from the National Science Foundation will fund a mentoring program at UNL for mathematicians entering graduate school, for those making the move from the advanced graduate level to an academic position, and for early-career faculty. UNL is supporting the mental-health-care research efforts of American Indian juniors and seniors as they prepare for graduate school, thanks to a five-year, $1.5 million grant from the National Institute of Mental Health. Several university departments will co-sponsor two seminars Oct. 8 in the Wick Alumni Center to discuss global affairs and the United States' role. In January 1998, the University of Nebraska adopted a policy designed to provide guidelines on the responsible use of our university electronic information systems. This is commonly called the "computer use policy." This information is from Michael Ruhrdanz, director of communications & operations in Information Services. Students help Mark Awakuni-Swetland, an assistant professor in anthropology and geography and ethnic studies, put up a tepee east of Memorial Stadium on Sept. 27. The Great Plains Anthropology class used the tepee for classes in the morning, and Awakuni-Swetland's Omaha I language class helped him take it down later that day. Football season is now well under way, and it can't be fall at UNL without a mention of the Huskers and the team's importance to campus history. UNL Theatre's University Theatre opens its 104th season with the classic Greek tragedy Medea by Robinson Jeffers, freely adapted from Euripides. These films will run Oct. 1-14 at the Mary Riepma Ross Media Arts Center. For show times and more information, call 472-5353 or visit www.theross.org/. Called the "Godfather of World Music" by George Harrison, sitarist, composer, teacher and writer Ravi Shankar is known worldwide for bringing Indian music to the West. Shankar will perform at the Lied Center for Performing Arts at 7:30 p.m. Oct. 5. The Lentz Center for Asian Culture has received a gift of 558 books and 584 catalogues donated by Margaret Hilmes of Kansas City, Mo. This group of materials will be known as the Hilmes Art Book and Catalogue Study Collection. It is housed in the Lentz Center for Asian Culture library and is available during museum hours by appointment. Two free origami workshops for children ages 7-10 will be presented Oct. 23 at the Lentz Center for Asian Culture. The workshops will be from 11 a.m. to 1 p.m. and 2-4 p.m. and are available because of an educational outreach grant from the Hixson-Lied Foundation. Workshop attendees must be accompanied by an adult. Limited seating is available; call 472-5841 to reserve a seat. The Lied Center for Performing Arts will present the Nebraska Jazz Orchestra at 7:30 p.m. Oct. 7 as part of the Nebraska Artists Series. Joining the orchestra will be vocalist Kelly Ellenwood. The Third Chair Chamber Players will perform from 5-7 p.m. Oct. 1 at the Sheldon Memorial Art Gallery as part of the museum's First Friday Celebration. They will perform in the Sheldon auditorium.